I had quite a busy weekend. On Saturday Mama and I cleaned out the pan-tree. I had to make sure all of my foods went back to the right place and When Mama and I clean things we take everything out and re-organ-a-zize it all so that it looks pretty and uniform, then we put everything in kittygories and we a-b-c it too. Mama calls those sub-kittygories. My job is to make sure all of my foods went back to the right place and that all the kitty food that spilled on the floor got eaten cleaned up. When Mama was busy cleaning the living room floor, she said I was a funny puppy. She was on her hands and knees trying to mop under the sofa and I crawled up behind her, through her legs and ended up with my block head poking out of her sweatshirt under Mama’s chin. What’s so funny about that? 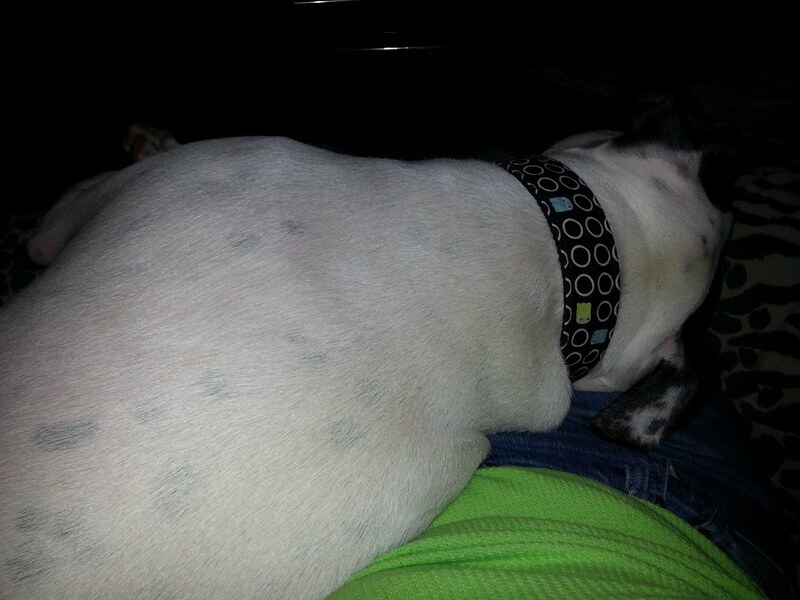 I love being near my mama. We cleaned the bonus room upstairs, too. That’s the room that the kitty toys are in. I like to run up and down the hallway like a little horsey when I go upstairs, but this time we had more organizing to do, so I just sniffed around. Mama said the best thing was when she was looking around for me and she found me in the living room standing very still, watching the mean old lady Boo Kitty eat her dinner. I didn’t try to bounce on her play with her at all and I got a treatie for not bum rushing her being such a good little brother. She is very old and has earned her retirement. On Sunday, Daddy and I played squeaky ball a whole bunch so that I would get rid of some energies. Mama says I have enough energies that I can burn some off and still be the same happy boy that I usually am, so when I had some burned off, Mama and I went bye-bye together. I had so much fun and met lots of nice people who wanted to pet the Ray-Ray and we talked to lots of other doggies, too. We were at one of the places that Mommy calls “shopping.” I like shopping and I wish we could go every day, but we only go on weekends. When we were at this store, though, Mommy wasn’t looking at new treats, which confused me but she saw a jacket for the Ray-Ray. When I was little, I wore clothes all the time but ,lately I don’t really like to wear them. I have a jacket that makes me want to do twirly dance and act funny, so I don’t have to wear that one very much. This one was different, though. It doesn’t touch my tail and it looks just like Mama’s coat! I let her put it on me right in the “shopping” store and I kept it on without twirly dancing, so Mama pulled off the tags and took them to the treat person cashier. He said I look very handsome and Mama gave him her shopping monies and he took a picture of me and my Mommy right in the store. I wore my new coat all the way home and I was very cozy in it. When we got out of the car, Daddy saw us and said, “Seriously?” I think that means he likes it and wishes he had one like ours too. Mommy said I am her Mini-me. After all of my busy stuff over the weekend, I’m ready for a nice looong snore-y nap. I’m even too sleepy to tell you about the cookies Mama made for me so I’ll let her do that tomorrow. It sounds like you had quite the weekend, Ray! I love the part about your mom cleaning under the sofa and you peaking up through her sweatshirt =) You're so silly! Athena had quite the weekend too! 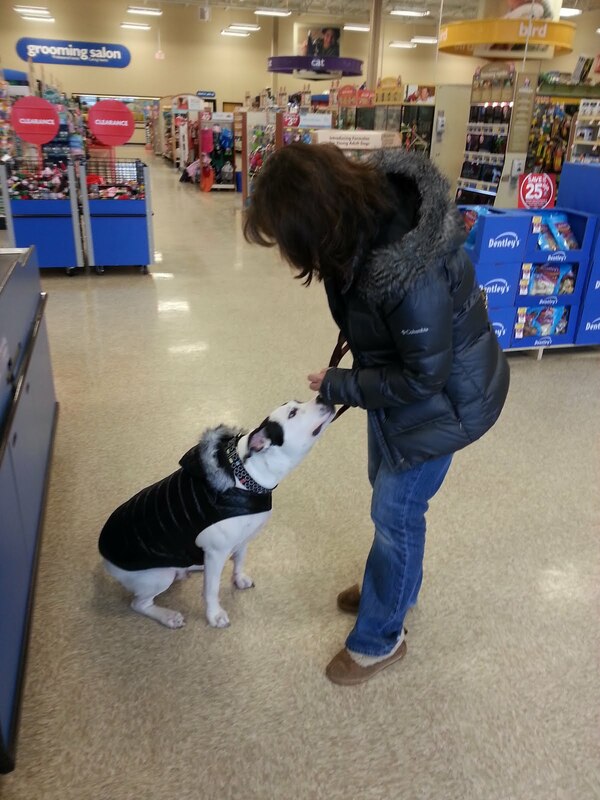 Like you, she went shopping at a treat store and met LOTS of new people and doggies. She even met her puppy twin at one of the stores! Athena also went on a trip to Home Depot, went on some walks, played with lots of her toys, and had flyball practice. 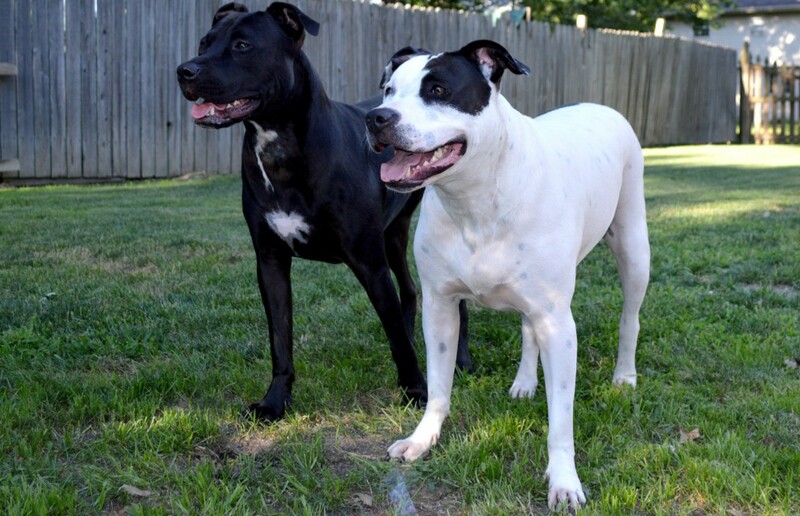 You and Athena could be best buds with your love for keeping busy on the weekends! I bet Ray and Athena WOULD be best buds! It sounds like she had a fabulous weekend! Wow, I think you had a pretty awesome weekend! And, we are so jealous of your pan-tree, we'd love to have something like that. That coat looks SO good on him! My heart is bursting, it's so adorable. Did you post that picture of your pantry to make me jealous? 🙂 We have the WORST cupboard space. Emily and Emily, my pantry is the best thing about my kitchen. My kitchen actually makes my house almost unsellable because it is so small…and the laundry is in the kitchen. Sounds like an awesome weekend Ray! I love your new jacket! What a beautiful coat! 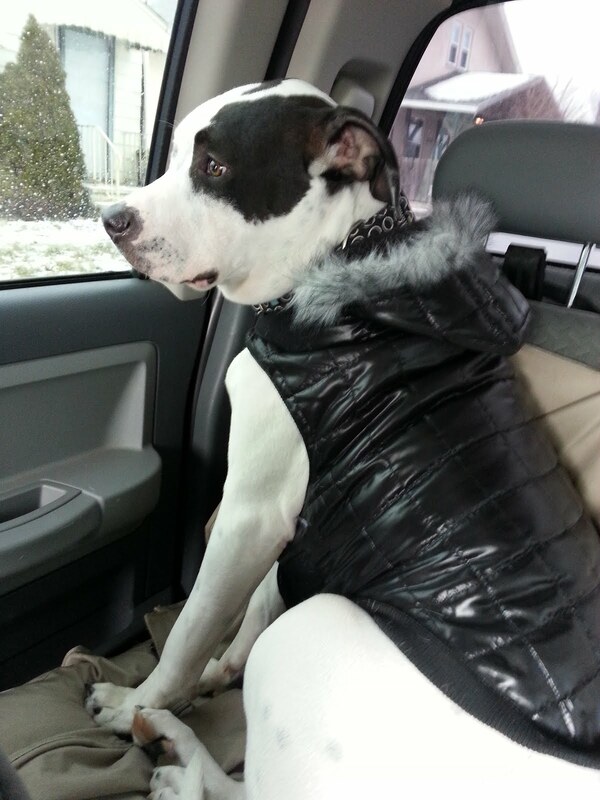 Tessie is jealous – she was supposed to get a new one for Christmas but then the car broke down! 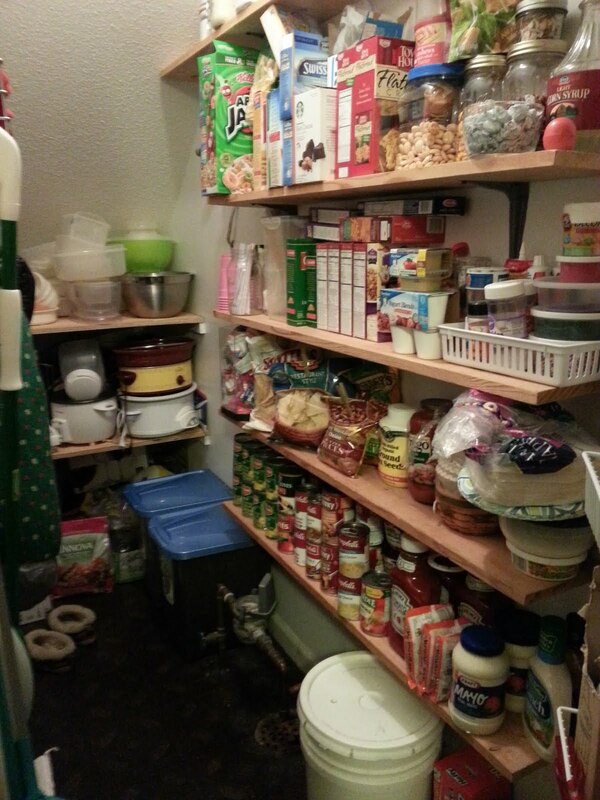 This coming weekend Ed will help me clean out the pantry, just like you! Haha…I love Ray's perspective on life! We did have a fun weekend which mostly involved hiking(which involved Kaya & Norman inviting themselves to someone's bbq) and cuddles(which involved me watching a lot of episodes of Shark Tank). Also, you look pretty spiffy in that fancy new coat!